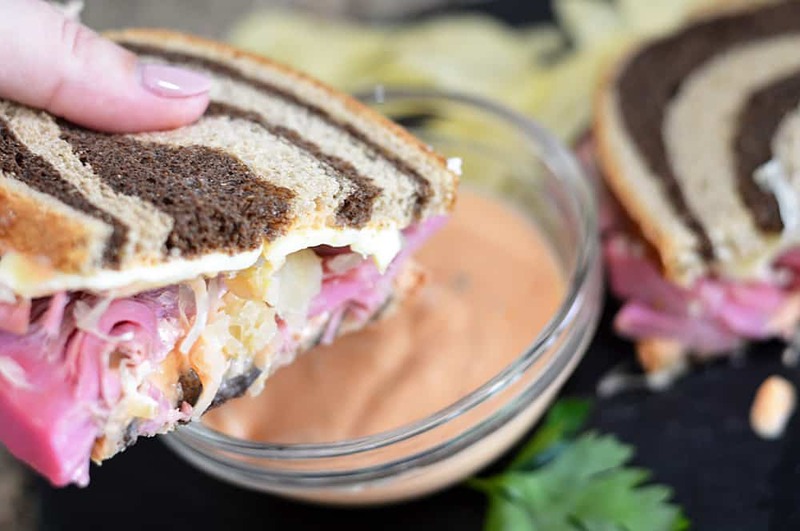 I have had this idea for VEGAN Corned Jackfruit Reuben on Rye With Sauerkraut and Swiss floating around in my head for a LONG time before I finally figured out how to make it a reality! 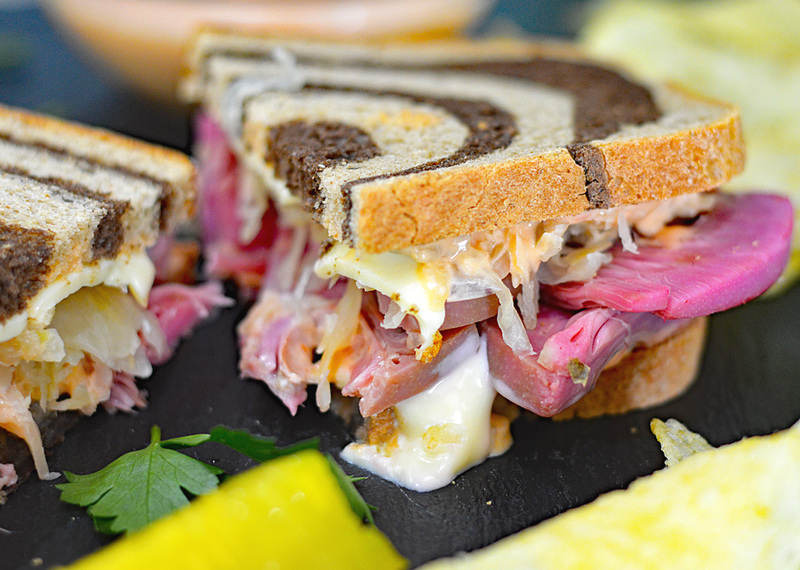 Everything on this reuben is completely vegan 🙂 If you haven’t yet tried jackfruit, you are really missing out on a great vegan alternative. I am continually exploring ways to prepare it for you. Links to my current favorite brand at the bottom of the post. I used the same concept to marinate this sliced jackfruit, but instead of slow cooking it, I cooked it in a non-stick fry pan. Unlike when cooked in the slow cooker, this retains the color much better. It’s tender and falls apart when you bite into it. 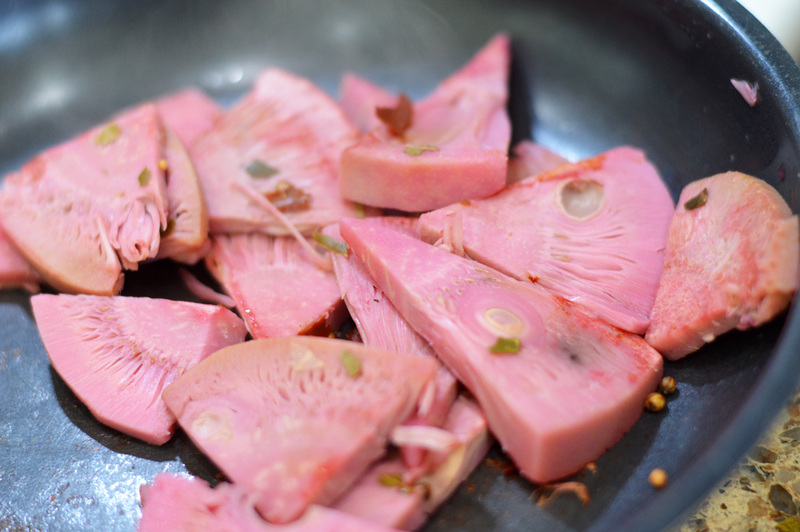 Since we are using the jackfruit packed in water, there is no brine-y taste to it. Important to note, I made my OWN pickling spices. As you’ll read in the Slow Cooker Corned Jackfruit and Cabbage post, I was really turned off by commercial blends who were adding things like cinnamon, cloves, allspice and ginger. It was just really off-putting to me. 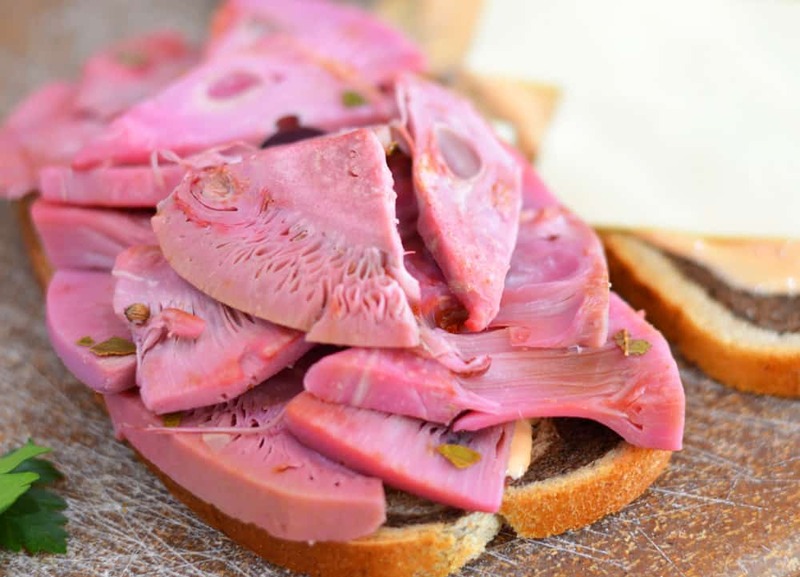 You can get the full pickling spice recipe here. I also placed a copy of it in the printable recipe for this post. The cheese I am using is the Creamy Original by CHAO. You can read more about why I love this vegan cheese alternative in my review here. It does actually melt! Okay, so now the jackfruit is cooked and I pile it high onto the cheese layer. Place the other half on top and put it in a toaster oven until the cheese just starts to melt. 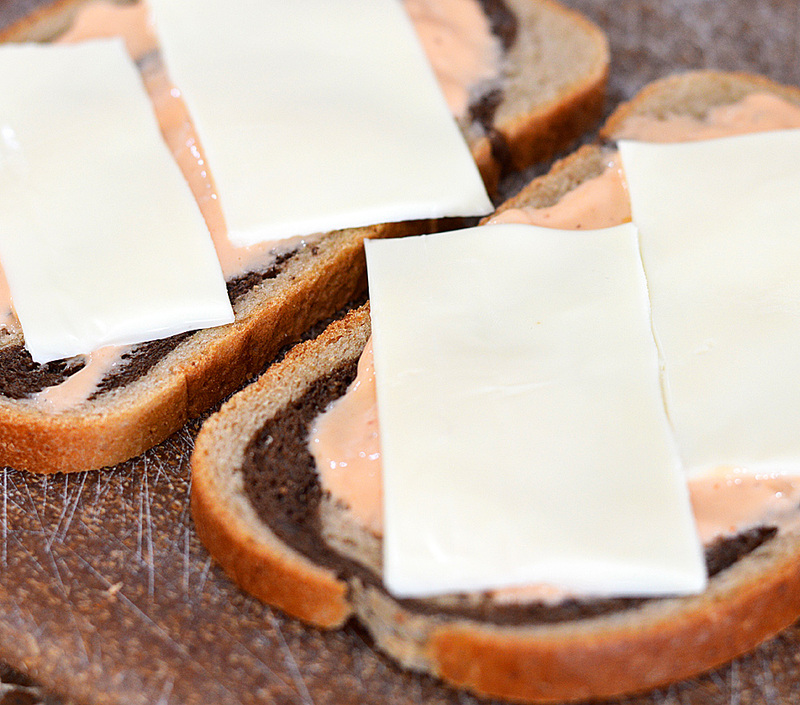 An alternative is to toast the bread before assembly or pan cook it grilled cheese-style. You could also place it in the oven for a few minutes. I like to serve with additional dressing (for dipping), classic potato chips and dill pickle spears. Yum! 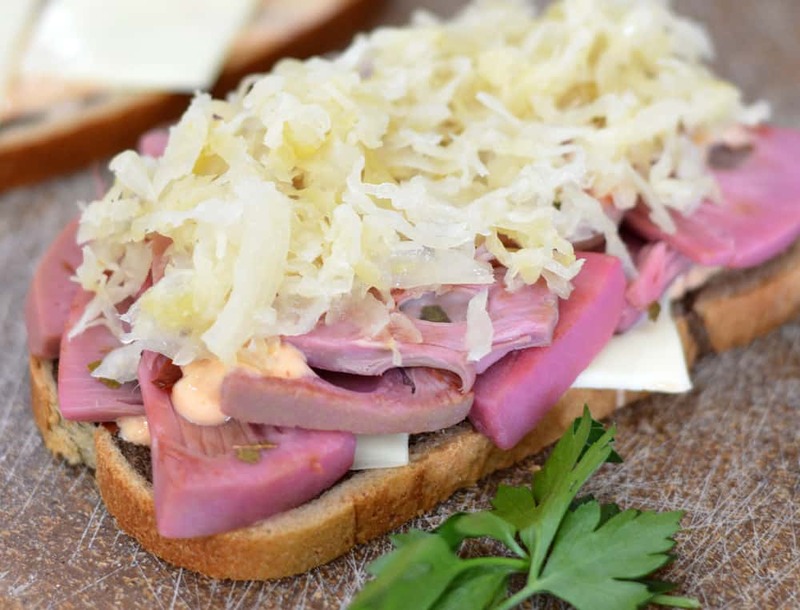 Did you make this recipe for VEGAN Corned Jackfruit Reuben on Rye With Sauerkraut and Swiss? Leave me a comment below and let me know what you thought! Combine the pickling spices (you can use a prepared blend, but beware! It has a lot of cinnamon, allspice and cloves which I wasn't a fan of). Add the drained jackfruit that you have sliced. Most brands of jackfruit come in triangular shapes. I took a sharp knife and made 3 thinner triangles out of each. 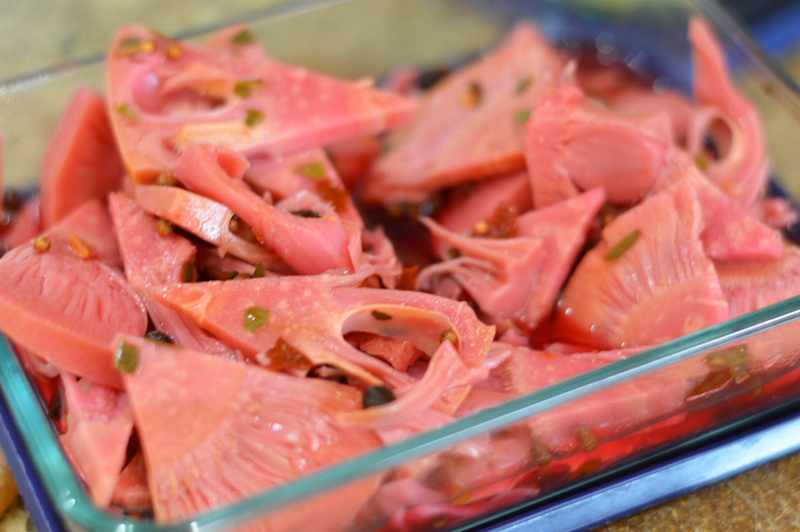 Marinate for several hours, better if overnight. Remove the slices from the marinade and place into a non-stick skillet over medium high heat and cook just until they start to show signs of browning. Most of the residual liquid should also be gone at this time. Whisk together all of the ingredients for the Thousand Island Dressing. Taste for seasoning and adjust flavors as needed. All that needs to be done for the sauerkraut is to drain it. Place the sandwich into a toaster oven (preferably) or you can also place into a non-stick skillet or even a panini press if you'd like. Serve with additional dressing, classic potato chips and dill pickle spears. Enjoy! 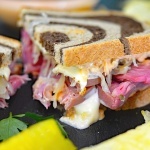 This is such an interesting take on the classic reuben! I definitely think the addition of the jackfruit could be so tasty! Can’t wait to try this at home. 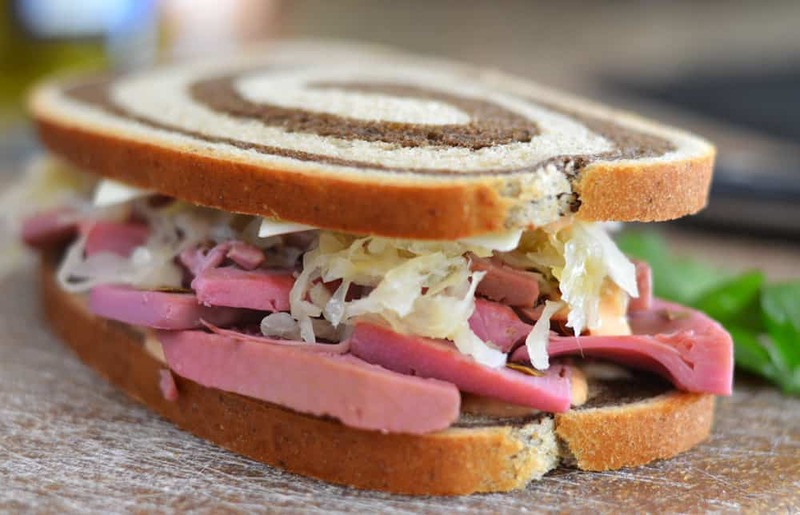 I’ve been looking for ways to use sauerkraut much more in my diet, and haven’t even thought of reincorporating the reuben! Thanks for sharing! This was amazing!!! Even my Omni eaters loved it! I did add a couple drops of liquid smoke but I’m sure isn’t necessary. My husband said he wouldn’t have known it was jackfruit.